Who Has The Best Setup For Triple Monitor Gaming? With the release of the dual-GPU AMD Radeon HD 6990, closely followed by the competing Nvidia GeForce GTX 590 we saw graphics card performance reach new heights. With bandwidth throughput in excess of 300GB/s, these cards can consume more power than entire computer systems. Moreover, the two GPUs on board of either product are so complex that combined make up for 11,000 million transistors. Generally speaking this type of graphics card is designed for the most demanding of PC gamers as they enable ultra high resolutions without even thinking about compromising visual quality. As of recent the only problem faced by gamers is that we haven't seen a great deal of computer games that really push the envelope, like the original Crysis game did, for example. Many had expected Crysis 2 to be the game that would bring even the most power hungry gaming systems to their knees. Sadly the reality was far from it as Crysis 2 in its current condition is nothing more than a well polished DirectX 9 engine port. 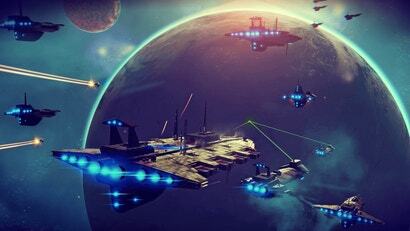 What we describe has become a widespread practice in the industry with a majority of new PC game releases being console ports to one extent or another - in the worst of scenarios to an overwhelming degree. Given the limited horsepower of today's console, which are now up to five years old, games designed with them in mind fail to stress modern PC hardware. AMD and Nvidia have seen this coming and decided to get a little creative. AMD was the first to aggressively push multi-monitor support with their Eyefinity technology. Announced along the Radeon HD 5000 series, Eyefinity allows you to connect 3 or 6 monitors to a single graphics card. By supporting SLS (Single Large Surface) the technology is able to group together multiple monitors which the operating system recognises as a single ultra high resolution screen. Nvidia responded with Vision Surround when they launched the GeForce GTX 400 series. Vision Surround has been adopted by the GeForce GTX 590 and it's been a driving force behind this graphics card offering. 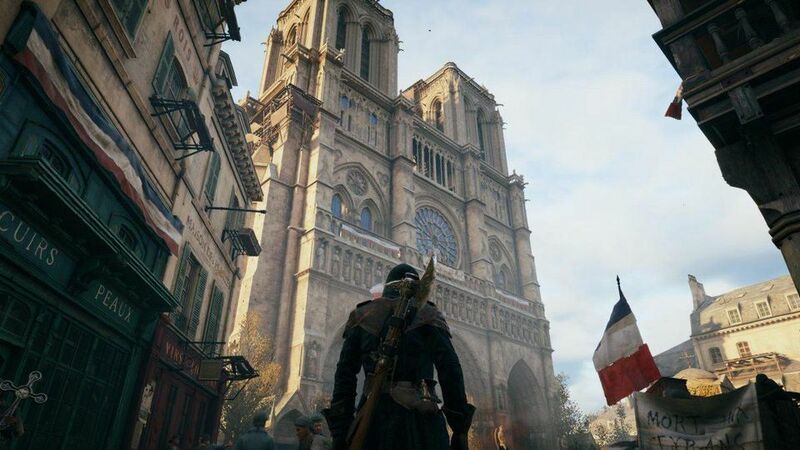 By utilizing three monitors games can become roughly 3x more demanding as the graphics card is required to render an overwhelmingly higher number of pixels. Whereas we commonly test graphics cards at single monitor resolutions of 1680x1050 (22"), 1920x1200 (24") and 2560x1600 (30"), today we are taking these and adding two more LCD monitors for effective resolutions of 5040x1050, 5760x1200 and 7680x1600. We'll show you the kind of performance you can expect when playing nearly a dozen popular games using triple 22-inch, 24-inch or 30-inch monitor configurations. Benchmarks: Civilization V, Dragon Age II For testing Civ V we used a saved game that is more than 300 turns in which provides a good representation of gameplay. Using Fraps we measured the performance at various zoom levels while scrolling around the map. The Radeon HD 6990 is back on top as we test with Civilization V and at 5040x1050 we found it to be 19 per cent faster than the GeForce GTX 590. This margin is reduced to just 9 per cent in favour of the Radeon at 5760x1200 and then finally 6 per cent at 7680x1600. Still we were impressed to find both graphics cards averaging over 30fps at 7680x1600 in this DirectX 11 title. 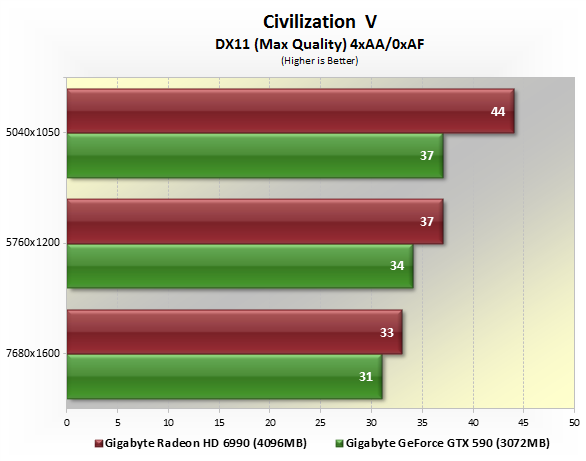 Also check out our complete Civilization V GPU/CPU performance report. Whereas Crossfire is poorly implemented in Crysis 2, the same can be said about SLI when playing Dragon Age II. Although recent Nvidia driver updates have done a lot to correct Dragon Age II performance it appears that SLI is still lacking even with the latest 270.61 driver. This in spite of Nvidia's claims that a GeForce GTX 580 SLI configuration will see up to 516 per cent performance increase at 2560x1600 with 8xAA/16xAF enabled using the "Very High" quality preset. We know that the GeForce GTX 580 is 10 per cent faster than the Radeon HD 6970 at 2560x1600, so the weak performance from the GTX 590 you see above is due to lack of SLI support. As a result the Radeon HD 6990 was 84 per cent faster at 5040x1050, 81 per cent at 5760x1200 and 133 per cent faster at 7680x1600. Also check out our complete Dragon Age II GPU/CPU performance report. Republished with permission from TechSpot.com. Steven Walton is the chief hardware editor at TechSpot; he also runs his own review site Legion Hardware. And for most people with the ATi cards they won't see that performance because of driver issues. Have 2 Samsung 21.5ich LEDs and 1 22inch LCD running at 5040x1050 with a HD6970. Took me a while to get used to it cos the peripheral vision was just weird. Now I can't play anything without it! Had to tone down AA to get the frame rates up, but it looks O so good. Assassins Creed Brotherhood was literally built for this kind of set-up. That's pretty much the exact kind of set up I was looking to do. 6970 seems to pack a good punch, and I think 22 inch monitors is big enough for a 3 monitor set up. What kind of power supply did you have to get to support the 6970, as I'm hearing that you need higher than what the recommended is for these cards as power supplies never quite put out what they advertise. I'm also a little worried about comments like the above that ATI cards have driver issues. Finally got my quad sli 2 x GTX590 build up and running last night. I'm looking forward to the weekend to see what it's capable of.